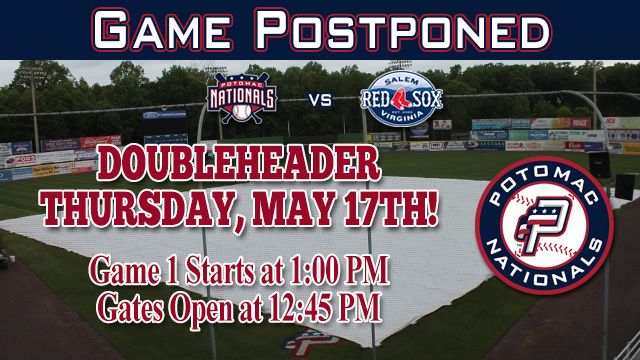 Woodbridge, VA---Rain have postponed Wednesday's doubleheader between the Potomac Nationals (22-15) and Salem Red Sox (17-20) at Northwest Federal Field at Pfitzner Stadium. The teams will play a doubleheader at Northwest Federal Field at Pfitzner Stadium on Thursday, May 17th, with first pitch of game one set for 1:00pm. Both games are scheduled for seven innings. Gates will open for Thursday's doubleheader at 12:45pm, while the first game will get underway at 1:00pm, with the preceding "P-Nats Lead-Off Show" at 12:45pm. The broadcast can be heard on potomacnationals.com or via the TuneIn Radio App. Thursday's doubleheader will be a "Thursday Cheers" game at the ballpark, with dollar sodas during the game.